Otto and the Robin - Lighthouse Poole. Christmas is a magical time of year. So what better way than to get in the festive spirit than to see a show. The Lighthouse in Poole are always putting on wonderful shows and this Christmas is no different. To run alongside Peter Pan (their main Christmas show) they have also commissioned Otto and the Robin. 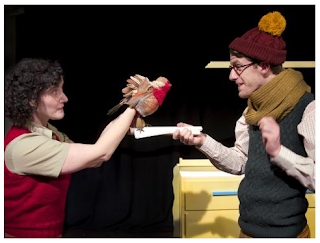 Otto and the Robin is an interactive show aimed at the under-8's and is set in the gloriously Dorset sounding town of Piddle Under Puddle. As you enter the theatre all the children are given invites to the big Christmas party at the village hall. The party is organised by Maggie, she's the life and soul of the village and loves nothing more than a good party. And everyone is going to be there! Everyone except Otto that is. Otto is a man that is overwhelmed by shyness. He can't bear to leave his cottage or even open his door or answer his phone. With a drawer stuffed full of invitations he's come to accept the fact he will always be too shy to join in. That is until he meets a robin who changes everything. This show is fantastic. The audience engagement is spot on and really draws the crowd in. From dancing to shouting and casting magic spells it really keeps them engaged. Which is hard to do when there's an audience of little kids. The puppetry of the robin is gorgeous, and the way they use the studio space to move through the audience means that we feel like we are part of the show. Max loved the fact he was asked to hang the bunting ready for the Christmas party and enjoyed giggling at the dad dancing Otto did. If you're looking for a show to lift your Christmas spirits then this is the one. The charming play will leave you wishing that you could have your own robin to help you along the way. 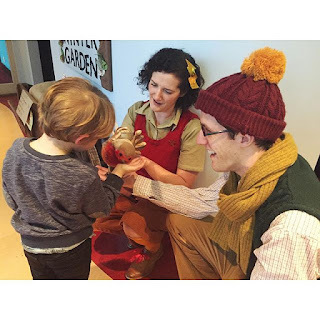 Otto and the Robin is on most mornings and afternoons between now and December 24th so don't miss out!